IFC Midnight have released the official trailer and poster for anticipated Pyewacket, the new film from Backcountry director Adam MacDonald starring Laurie Holden (THE WALKING DEAD; THE X-FILES) and Nicole Muñoz. 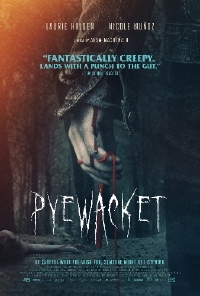 Pyewacket got great buzz out of the festival circuit with solid scares, excellent performances. When you’re dealing with demons, be careful what you wish for… In this ultra-unsettling occult nightmare, teenage Leah (Nicole Muñoz) finds solace from the recent death of her father—and from her strained relationship with her mother (Laurie Holden)—by dabbling in the dark arts. It all seems like harmless fun at first, until a blow out argument leads Leah to do the unthinkable: put a death curse on her mother. No sooner has the girl performed the ritual than she regrets it. But it may be too late, as an evil presence known as Pyewacket begins to make itself known—and threatens to destroy both mother and daughter. Follow Quiet Earth on Instagram.